Momentum has secured over $100 million for our clients since 2006 with a success rate in the order of 80%. Hundreds of thousands of dollars are available on an annual basis through various sources such as Government (Federal, State and Local), businesses and philanthropic organisations. Facility projects that we are typically involved in include: Sports field lighting, clubhouses, change-rooms, playing fields, synthetic surfaces, courts, stadiums and pools. From a club development perspective Momentum offers a raft of services designed to build club capacity under the banner of our 'Club One' program. 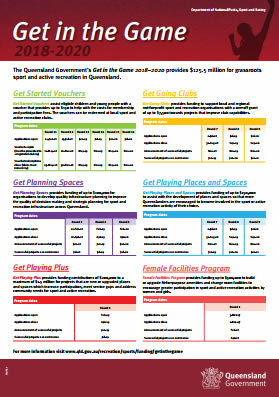 The cost of the 'Club One' program can be covered by various grants. The critical thing when it comes to grants is to plan. A significant amount of material needs to be collated to support a grant application – a coordinated and systematic approach is essential.